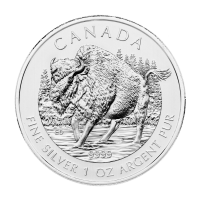 Moneta in argento 1 oz 2013 Canada bisonte delle foreste The limited edition, 9999 pure silver, 2013-dated "Wood Bison" is the sixth and the final coin of a six-coin series of silver bullion coins celebrating Canada's Wildlife. The reverse design of 2013 "Bison" silver bullion coin is the work of the Canadian artist and coin designer Emily S. Damstra and its obverse features the Susanna Blunt effigy of Her Majesty Queen Elizabeth II. This 9999 pure silver bullion coin bears a face value of $5.